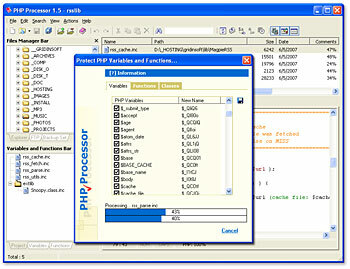 PHP Processor is designed to help you protect your intellectual property when distributing PHP source files. The other use for PHP Processor is to optimize PHP source code and considerably decrease size of your source code files. PHP Processor provides a fast, intuitive way to obfuscate your PHP source code. Both variable and function names can be replaced with meaningless strings making your code difficult to read and alter for a third party. ...... a third party programmer. Qweas is providing links to PHP Processor 1.5.0.3 as a courtesy, and makes no representations regarding PHP Processor or any other applications or any information related thereto. Any questions, complaints or claims regarding this application PHP Processor 1.5.0.3 must be directed to the appropriate software vendor. You may click the publisher link of PHP Processor on the top of this page to get more details about the vendor.